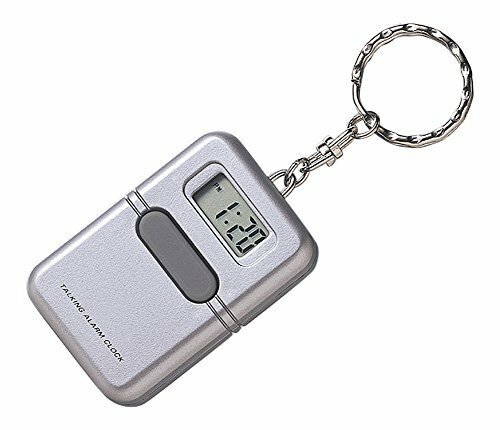 The Silver Talking Clock Keychain is ideal for low vision individuals on the go, displaying and announcing the time as needed in a clear voice. This clock also has an alarm, which either talks or crows. This little talking clock fits easily in your pocket, pouch, purse or on your keychain. * This clock may arrive in sleep mode. Press and hold the bar button beneath the digital display window for 5 seconds to awaken this clock. Pointers for setting this clock: Use something pointy, like an unfolded paperclip, to work with the mode, hour and minute buttons. The first mode is 12H vs 24H time mode. It will say 12 as the first mode, press the middle hour button to change to 24 or press mode again to set time, etc. Lightweight & portable, carry it in your pocket. If you have any questions about this product by LSS, contact us by completing and submitting the form below. If you are looking for a specif part number, please include it with your message.